If you weren’t able to be at the temple this past weekend, you missed back-to-back wins for Atlanta. The beginning of the ARG May Double Header started with a bang. 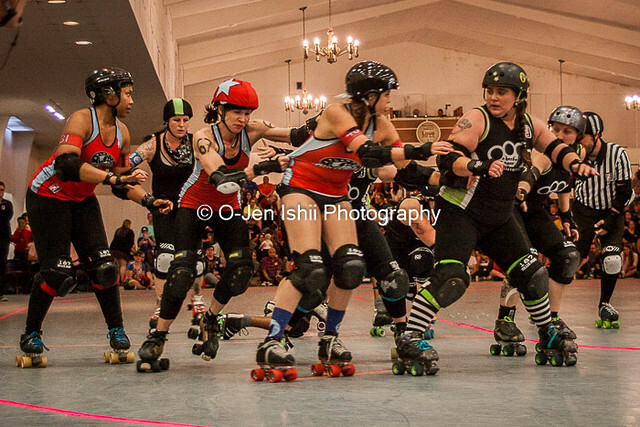 Human Missile Crisis slammed a large 9 points on the board, followed by another 9 from her teammate, Hate Ashbury. Columbia had some penalty trouble in the beginning which resulted in a few power-jams for Atlanta, and in 10 minutes the score shot up 50-18, Atlanta lead. 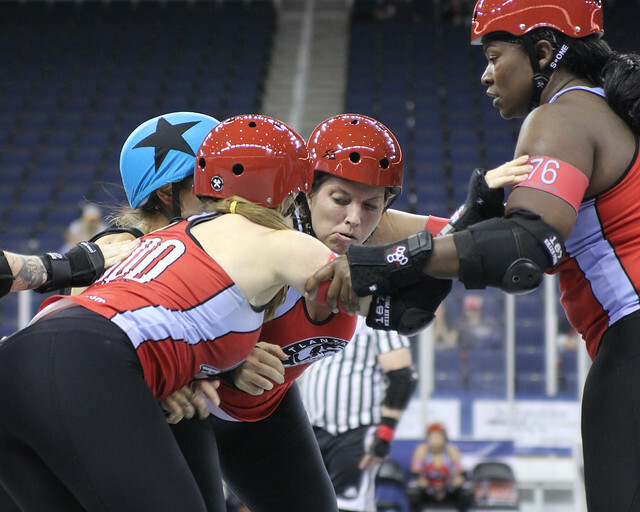 Columbia gained their footing, putting points on the board here and there, but Atlanta continued to gain long scoring runs which ended the first half 138-56 Atlanta lead. The Second half followed suit. Columbia started to put more points on the board, but Atlanta maintained their momentum, gaining 10+ points in back-to-back jams. 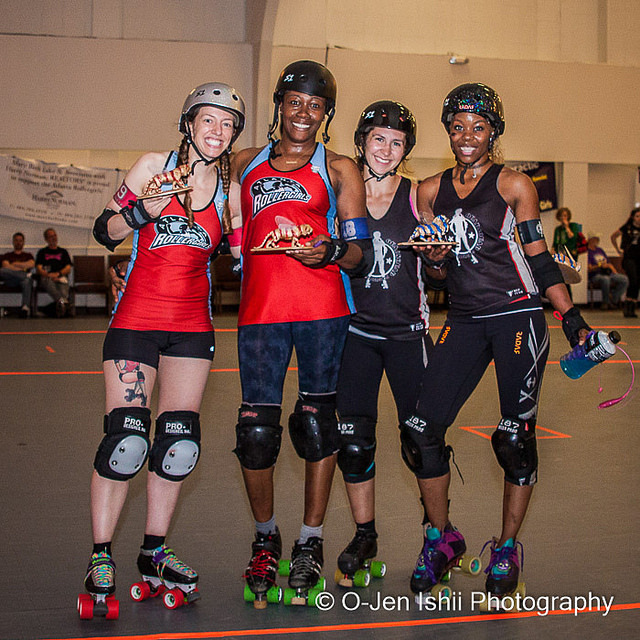 The game ended with the Atlanta Rumble B’s victorious, 266-125. In the first five minutes of the second game in the ARG May Double Header, Atlanta gained momentum, resulting in a 19-3 Atlanta lead score. Atlanta continued to pull ahead, utilizing a rotating defensive formation and offense for the occasional power-jam. Baltimore kept the game relatively close. 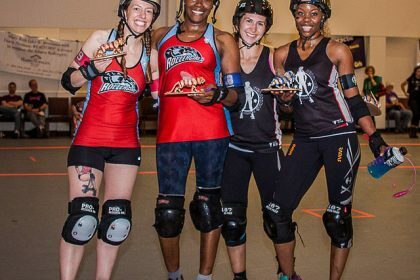 Their hard-hitting defense posed difficulty for the Atlanta jammers, but ultimately the half ended 100 – 71 Atlanta lead. The second half continued in Atlanta’s favor. Baltimore continued to play a hard-hitting, defensive game, but Atlanta’s offense and stamina continued to do damage as multiple penalties were called against both teams. 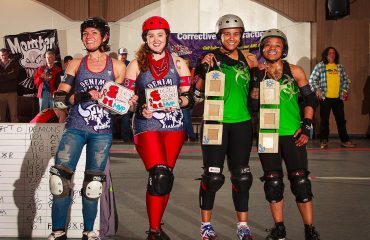 The Atlanta Dirty South Derby Girls won over the Baltimore Charm City All-Stars 221 – 130.